With this year's iPhone revisions, Apple introduced a new breed of flexible circuit board crafted from liquid crystal polymer, a material that benefits high-speed, low-latency data transfer. Currently used in iPhone 8 and iPhone X LTE antennas, and the latter's TrueDepth camera, the technology is expected to make its way to other product lines next year. 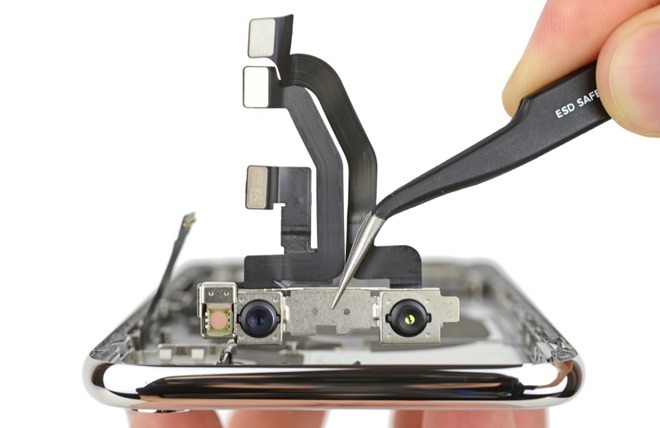 In a note to investors seen by AppleInsider, KGI analyst Ming-Chi Kuo says Apple is working with partner suppliers to integrate LCP FPCB hardware across its major device lineups including iPad, Mac and Apple Watch. Specifically, Kuo predicts Apple is already working with FPCB manufacturer Career on designs for MacBook that will not only save space, but improve internal data transmission capabilities. For example, LCP is a likely candidate to enable a smooth transition to USB 3.2 and next-generation Thunderbolt specifications, both likely to require high-speed data transmission thresholds. Additionally, Career is also thought to be working on new Apple Watch LTE antenna designs that integrate LCP as a base material. Watch's existing cellular antennas, also made by Career, are built on polyamide FPCBs. Compared to legacy materials like PI, LCP offers a number of operational advantages including superior frequency attenuation, thermal performance and moisture resistance. The substrate's assets tick off the right boxes for Apple, which year after year pumps out a set of increasingly complex portable products that rely heavily on fast, capable data lanes. "LCP FPCB production presents a greater challenge compared to PI, as the former needs to be more particular as regards material stability, higher-temperature process, impedance control and higher standards of etching process," Kuo writes. As for iPhone, Kuo in a November note said he expects Apple to integrate at least two LCP LTE antenna modules per device, if not more, to take advantage of cutting-edge transmission standards like 4x4 MIMO. Kuo sees wider adoption of LCP FPCB technology picking up in lockstep with Apple's move toward the material in 2018. Given their experience with LCP processes, Career and Murata are well positioned to become key players in the new trend and should hold their place as industry front runners until at least 2019, Kuo says.